Items 330- out of displayed. 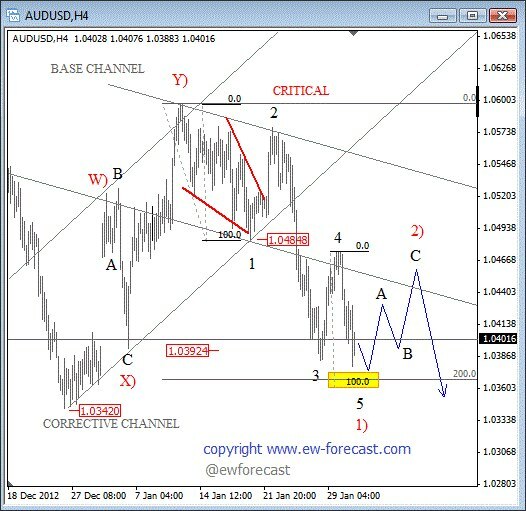 AUDUSD reversed nicely lower yesterday and already made a new swing low, which means that pair has now five wave down from 1.0600 high, called an impulsive wave. In Elliott wave theory impulses show direction of a current trend. As such, we are ready for more aussie weakness but could see a corrective retracement back to 1.0465 before downtrend resumes. There is a Fibo zone around 1.0370 and December low just beneath it that could cause a bounce. Pound is already recovering about we warned you yesterday when we highlighted a five wave fall in wave 3). Notice that current prices are already testing upper trend-line of an impulse channel. Break of this line usually confirms end of a wave 3). In our case it means that market is in a temporary recovery mode, ideally in wave 4 which will retrace back above 1.5800 possibly even to 1.5900 level in sessions ahead. Larger trend however is still down, but we need to see a completed three wave rise in 4) before we may look for weaker GBP again. Pound is falling sharply for the past two weeks from 1.6180 Jan 11 swing high. Notice that decline from that high can be easily counted in five waves. That’s called an impulsive structure which represents huge red wave 3) which is part of much bigger five wave decline started back on Jan 2nd. Therefore we expect much deeper levels on cable, but not just yet. In fact, we think that before market breaks lower again we will see a corrective bounce in wave 4), ideally back to 1.5800-1.5900 range before new sell-off begins. Pair is also approaching some strong Fibo support for current third wave; its 1.618 x wave 1) measured from wave 2) high which very often reacts as a turning point at the end of a third wave. In our case that’s comes in at 1.5650. Bottom line: watch for a corrective bounce in 100-200 pips before new leg lower. USD has been trading higher against its rivals during the Asian trading hours. AUD, GBP and CAD are still one of the weakest while JPY is trying to find some support for the near-term. Larger picture of the markets remains unchanged but still very messy. Below we have an overlay chart between some major FX currencies compared to S&P Futures and Crude Oil. We can see a strong negative correlation between FX pairs where only the EUR is moving higher in-line with risk-on assets, such oil and S&P. Honestly, we do not like divergences too much, especially not between aussie and S&P which in fact could be signaling for a coming pull-back on stocks. Anyhow, traders need to trade what they see and not what they think, so at the moment looking for longs on EUR-crosses should be the best choice. See you on the intra-day updates page with more charts and comments. EURUSD broke higher last week as expected and closed above important 1.3400 resistance level after a nice pull-back down to 1.3250. Current break is just another confirmation of our bullish view for an impulsive wave 3) rise in wave (C). As such we expect even higher levels now towards 1.3640/1.3700 next week while market trades above 1.3250 support. Meanwhile any pull-backs on a lower time frame should prove corrective. The reason why we think that EURUSD is headed much higher is USD Index which is still trading above its 2012 September low. Break of that level should occur as recovery since then is clearly corrective in nature so movement should be fully retraced which will pressure the USD and lift the EUR. In fact we are tracking a triangle pattern, which is a continuation pattern in our case that means break lower. EURUSD finally broke to the upside which was expected after few days of a sideways price action in a shape of a triangle pattern. Pair already passed 1.3400 resistance level which now opens the door for 1.3500 or even 1.3550 level for the next few days. Trend is bullish as long as market trades above 1.3260. Meanwhile any pull-back to 1.3350 should prove corrective. Pound fell to a new low against the USD and slowed down just 5 pips from 1.5750 projected level. Notice that pair now has five waves down from 1.6180 which is the first evidence of a coming bounce, especially if we respect the bullish divergence on the RSI. Larger pull-back however could prove corrective and may stop at 1.5900 swing level that will may react as a resistance. Silver has been in the uptrend-mode since start of January and it seems that bullish momentum has started to weaken from 32.45 peak. This however is not a surprise as market completed a fifth wave of a five wave sequence. In Elliott Theory we know that after every five waves correction follows. The interesting thing is that corrections usually starts after a divergence between wave 3 and wave 5 highs like in our case as shown on the MACD. Elliott Wave technicians will also know that corrections are structured minimum by three waves, so traders should be aware of a larger and deeper A-B-C pull-back possibly even back to 31 figure, near 38.2% retracement and Jan 17 swing level. After a completed three wave fall traders should again be on the watch for a bullish turn.